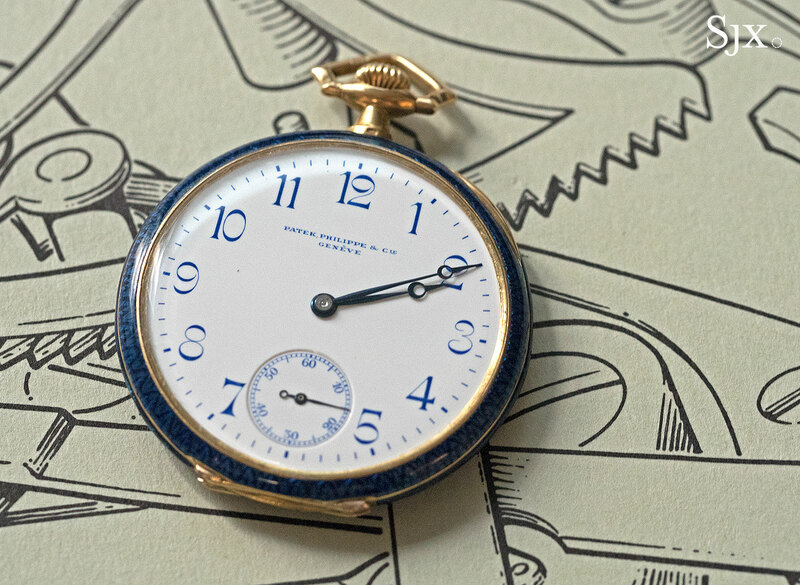 The energetic and inimitable Jean-Claude Biver explain the secret to success in watchmaking. Jean-Claude Biver is a well known personality in watchmaking, the closest the industry has to a celebrity chief executive. A gentleman farmer who famously makes his own artisanal cheese, Mr Biver made a fortune reviving Blancpain and Hublot – Swiss business magazine Bilanz estimates his net worth at SFr175m – but he didn’t stop there. Since 2014 he has been in charge of TAG Heuer as well as the LVMH watch division that also includes Hublot and Zenith. 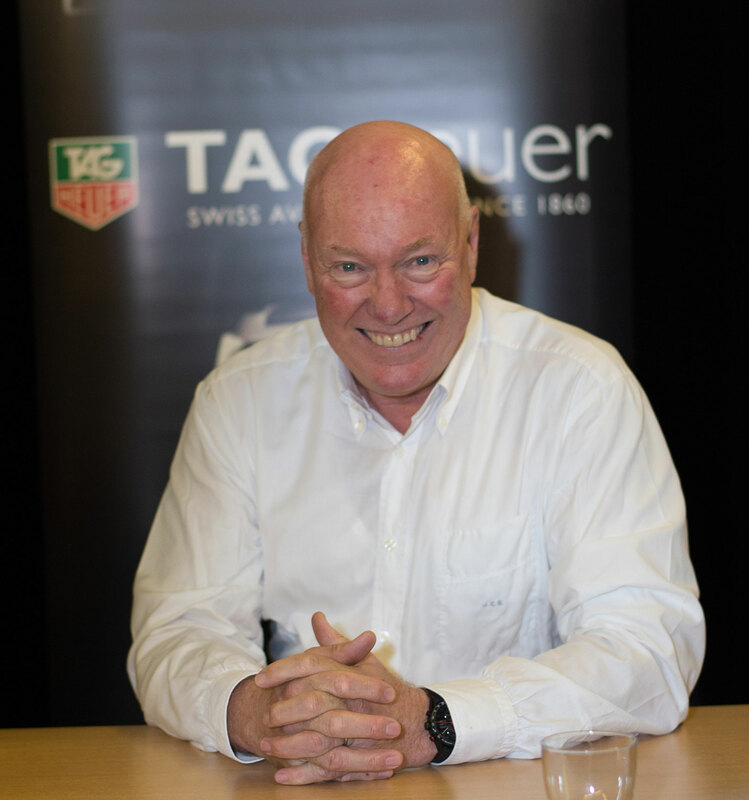 Since taking the top job at TAG Heuer in December 2014, Mr Biver has revamped the brand, changing products, strategy and management. 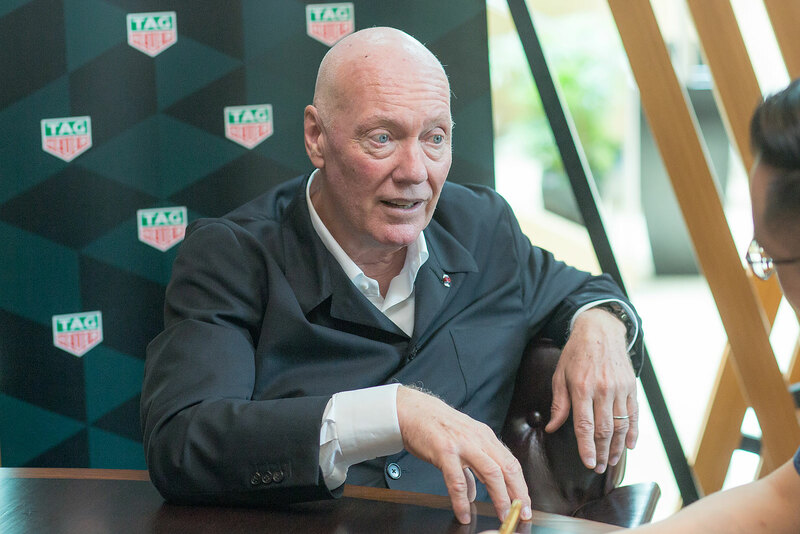 Despite some superficial similarities between his approach at TAG Heuer and what he did at Hublot, Mr Biver is keenly aware between the two, evidenced by his emphasis on TAG Heuer’s affordability and “perceived value”. 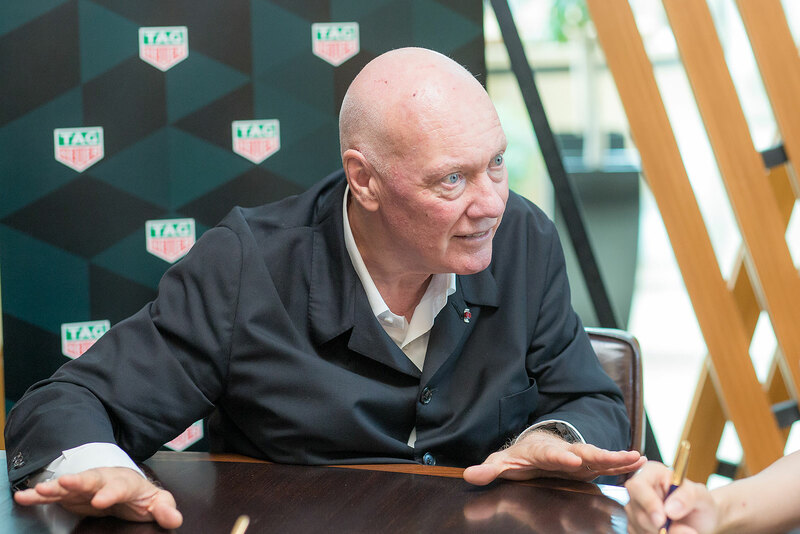 His master plan has quickly shown success, with TAG Heuer being frequently singled out for praise in LVMH financial reports, with the most recent half year statement from August 2016 noting a “successful refocusing of TAG Heuer on its core range”. 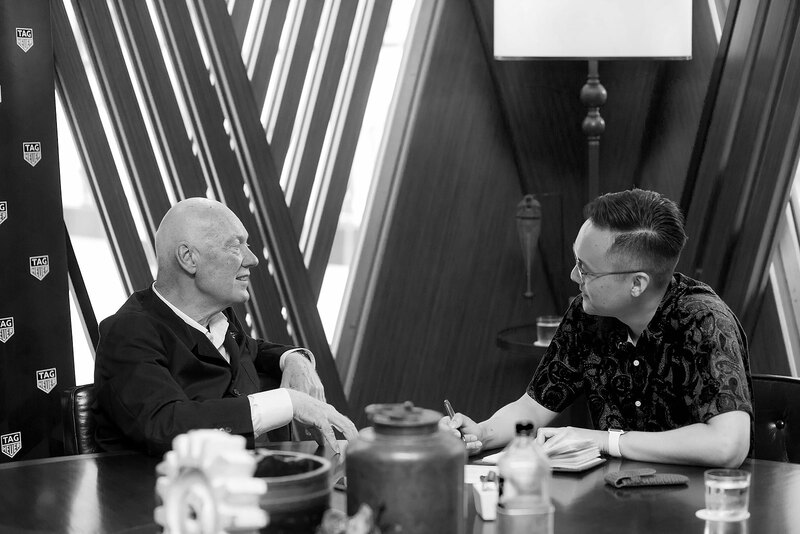 Mr Biver – who is now 67 but powers through the day with the energy of someone half his age – visited Singapore in early November, part of a whirlwind world tour for the 10th anniversary of Hublot’s All Black line of watches. Your correspondent spoke with him, and this is what he had to say. My role was to redefine the commands of the brand. What are those commands? I defined three conditions that must be always fulfilled. First condition, the brand is TAG Heuer. “TAG” means Techniques d’Avant-Garde [the name of the watchmaker’s former corporate parent]. If in your family name you have techniques d’avant-garde, it means you must be avant-garde, so you must make a connected watch, you must use new technology, you must be always connected to the future. Boom! That is condition number one. Condition number two: we must be the leader in the affordable luxury. I am not a luxury brand, but I am the leader in affordable luxury. So what does affordable luxury mean? 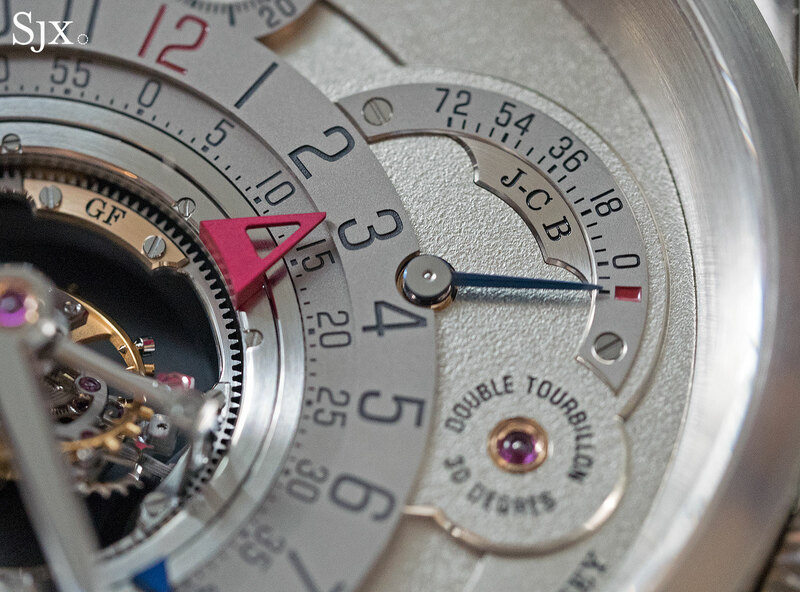 It means a tourbillon at US$15,000. An expensive watch but it is still affordable compared to the prices of normal tourbillons. Condition number three: I must always have a perceived value that is at least double the price. So if you make a tourbillon, make it affordable, and make it look like it costs double. So those are the three conditions for the brand to exist. Anything that comes in the factory, [for example] a new proposal for an event, will always be checked against these three conditions. The first three commands are for everybody in the company. For the little marketing department I have also defined some conditions. And one condition was that we do not follow a brand concept, we follow a customer concept. What does it mean? In the past a brand concept was to say a brand is linked to sailing [for instance]. Then all the communication and marketing activities, advertising, events, were based on sailing, sailing, sailing. TAG Heuer in the past was motor racing, motor racing, motor racing. So I said we should not look at the concept from [the brand’s] perspective, we should look at it from the consumer’s perspective. If my consumer likes motor racing, but at the same time he likes rugby sevens, football or rap music, or he loves a certain lifestyle, then we must follow him. That I call ‘zero separation’ from the consumer. Wherever the consumer goes, whatever the consumer does, whatever my customer likes, he must see TAG Heuer there. If he meets TAG Heuer every time, in the end he will believe TAG Heuer is part of his lifestyle. And when he believes TAG Heuer belongs to his lifestyle, it’s easier to sell. We have the profile of the customer who cannot buy TAG Heuer, and we have the profile of the customer that buys TAG Heuer today. It’s very important to know the ones that cannot buy now because they are the ones that will buy next year, or in five years, or eventually in ten years. You can put maybe 60% of the [marketing] money on the people that can buy, but you have to put the 40% on the people that cannot buy now, but in five years. If you don’t start talking to these people, how do you expect them to buy the day they can afford to? It’s what I call the Ferrari effect. Every young boy has dreamt at a certain moment about the red car. And so when he is an entrepreneur, 37 years old, and for the first time successful, he buys a Ferrari just to fulfil a dream, not that he needs a Ferrari. He needs to make a dream come true. He has dreamt so long about this car that finally he buys it. And this is what we are working on. We are reorganising the restoration department [that] did not exist before. Now we have a [dedicated team] of 18 people that are taking care of the patrimony of the brand, which is the museum, vintage pieces, spare parts. Once we have all [the historical information] registered, then we are ready to provide information to collectors. If we cannot provide this information, collectors will not collect, because such information is the most important tool for a collector. He wants to know when was it made, how many pieces were made, who made it, why was it stopped, and so on. Some pieces are missing from my own collection. So why should I let other people buy what I need? It’s a shame that the museum doesn’t have these pieces. So since I started I have bought probably a dozen of TAG Heuer’s historical, important pieces that I needed in the museum. But I haven’t bought more than 12. And this has made a lot of noise, and still today prices are going up and up and up. And everybody is now very hot on TAG Heuer collector pieces, which is great for us because we can now answer every question, we can provide certificates for every watch. So I think it is an important part of our business is to respect and to understand and to be able to certify our history. I always say you only get old when you stop learning, when you stop being curious, when you start to think that you know [everything]. Then you are old, and then you should retire. I am still curious, I still believe I don’t know, and I am still hungry to learn. Now how do I do that? I have the incredible privilege to have five kids. The oldest is 38, while the youngest is 16. I talk a lot to the youngest because I am fascinated by the new generation. If I don’t know the brands he is buying, the type of music he likes, if I don’t know the type of tattoo he wants to have on his body, then I will never understand the new generation. If I don’t understand the new generation, then I cannot do my job. Because my job is not to feed the old [customers], I have no problem with them, I understand I know how they react, but I also need the future. The future [generation], they will judge my job, not the old people that are dying with me. By the way, we have an advisory board at TAG Heuer, made of people between 14 and 18 years old. And I meet with them. We show them advertisements. We ask them what do you think of Gigi and Bella Hadid? What’s your opinion about Lady Gaga? We ask all these questions, we show them pictures, we show them products, and they give us their judgement and recommendation. I listen to these young people. I am very excited and I admire and I respect the future. I never thought I would be one of the few remaining [pioneers of modern watchmaking]. [laughs] You see, now you remind me that I never think like that. I never think that I am one of the last remaining. I just think that I am a member of the future of Swiss watchmaking. You know when I talk to you I don’t think that you are younger or older, I think we are the same. But you are right, I am one of the last. Probably together with Mr Philippe Stern, the owner of Patek [Philippe]. Philippe Stern and myself, we might be the two last guys from that generation who played a role. There are others that are as old as me, but they didn’t play the same role. So Philippe Stern and myself, we might be the last ones. Breitling is in the preliminary stages of selling itself to a luxury conglomerate, according to a report on Bloomberg. One of the few family-owned watch companies of significant size left, Breitling has been in the hands of the Schneider family since 1979. According to Rene Weber, an analyst at Bank Vontobel quoted in the Bloomberg story (and whom we interviewed earlier this year), Breitling’s 2015 revenue was about SFr370m, or US$364 million, accounting for about 5% of high-end Swiss watch sales. Breitling could fetch between SFr600m and SFr900m, according to another analyst quoted in this Bloomberg story. 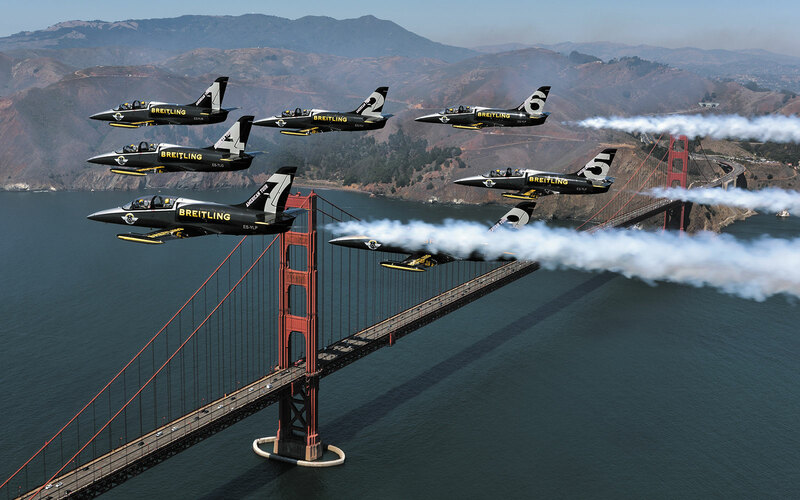 The company built its images on pilot’s watches, recruiting John Travolta as an ambassador and even sponsoring its own aerobatics team. While prominent in the 1990s for its luxe pilot’s watches, Breitling has lost ground to the competition in the last decade, especially after its move upmarket with pricier watches featuring in-house movements like the most recent Chronomat 44. And earlier this year it introduced the Chronoworks, one of the most technically impressive watches of 2016, but priced at just under US$40,000. Bloomberg’s report didn’t name the suitor, but Breitling’s focus on pilot’s watches would make Richemont an unlikely suitor, given its ownership of IWC and Panerai, which compete in a similar segment. That would leave the Swatch Group, which is busy putting its own house in order, as well as the diversified luxury conglomerates, namely LVMH and Kering. LVMH owns TAG Heuer, Hublot and Zenith, while Kering has Ulysse-Nardin and Girard Perregaux. Update December 1, 2016: Estimated sale value included. An evening sale that took a while to get going, but really got going when it did. A day after Phillips’ thematic Rolex sale that peaked midway with the record setting Rolex ref. 8171 “Padellone”, the auctioneer just concluded The Hong Kong Watch Auction: Three. This time the sequence of events was inverted: momentum built up haltingly, with several modern complications, including a Lange Tourbograph, passing with no interest. Fortunately the action picked up in the middle, leading to some stellar results unsurprisingly dominated by Patek Philippe. 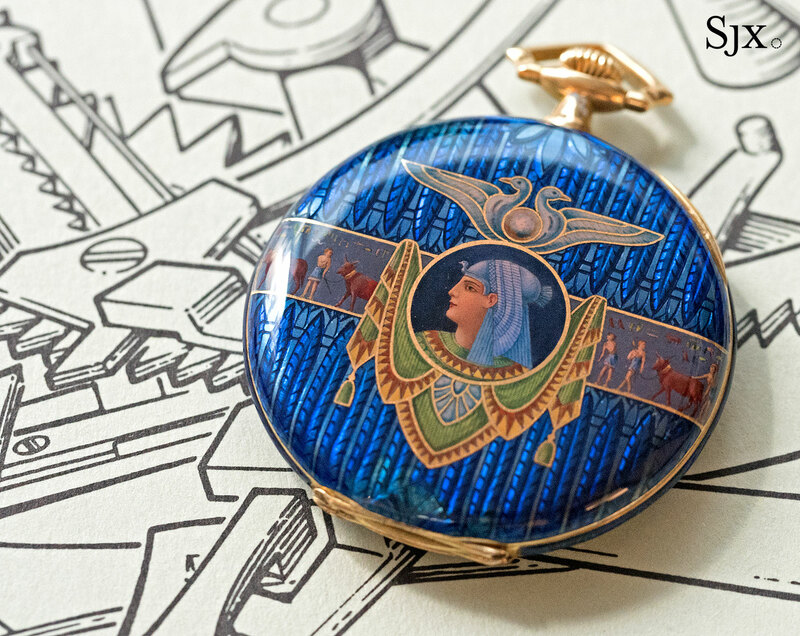 One of the biggest surprises of the evening sale led by Sam Hines and Aurel Bacs was lot 1104, a pretty Patek Philippe pocket watch featuring an enamelled Egyptian motif that was one of our pre-sale favourites. Who knew King Tut was so popular? 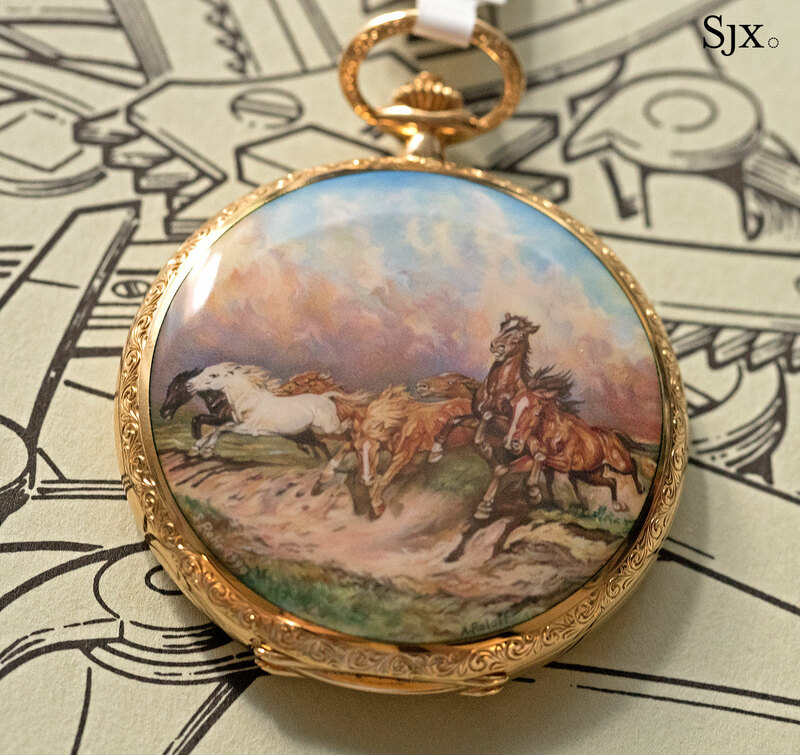 Striking and wonderfully preserved, the one of a kind pocket watch was estimated at HK$500,000 to HK$1m, or about US$64,000 to US$125,000. After several long minutes of enthusiastic bidding from several bidders, the lot sold for HK$4.04m, or US$521,000, all fees included. It went to a bidder, presumably European, represented by Nathalie Montbaron of Phillips. 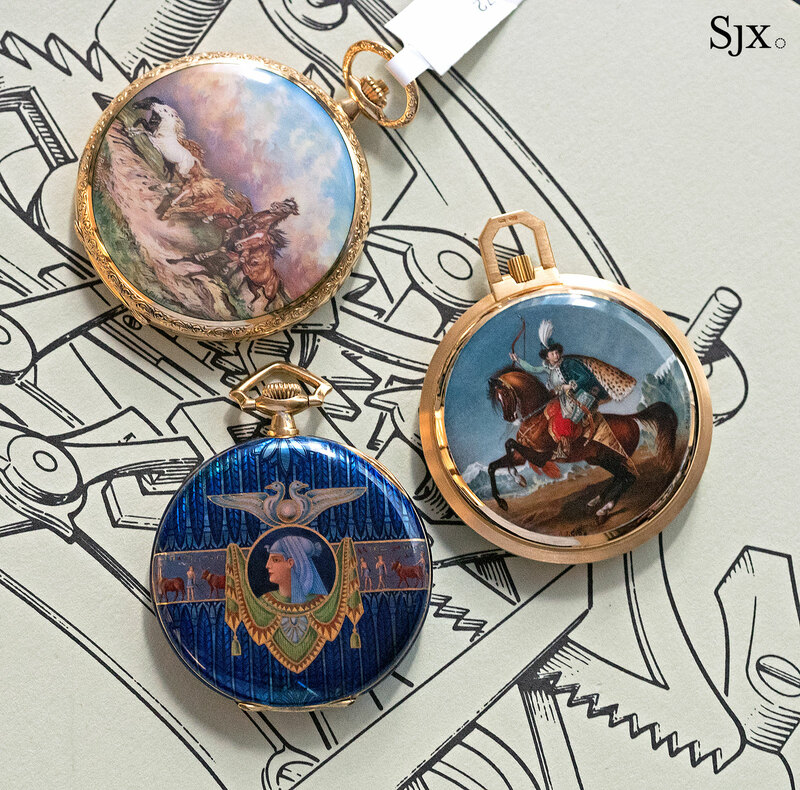 The two miniature enamelled pocket watches that followed also blew past their estimates. Lot 1106, featuring wild horses painted by noted enamel artisan Suzanne Rohr, went for HK$5m, or US$645,000, more than double the high estimate and a record for Rohr’s work. Another decorative Patek Philippe timepiece that sold handsomely was lot 1108, the ref. 1191 Dome Clock originally sold by Patek Philippe in 1987. 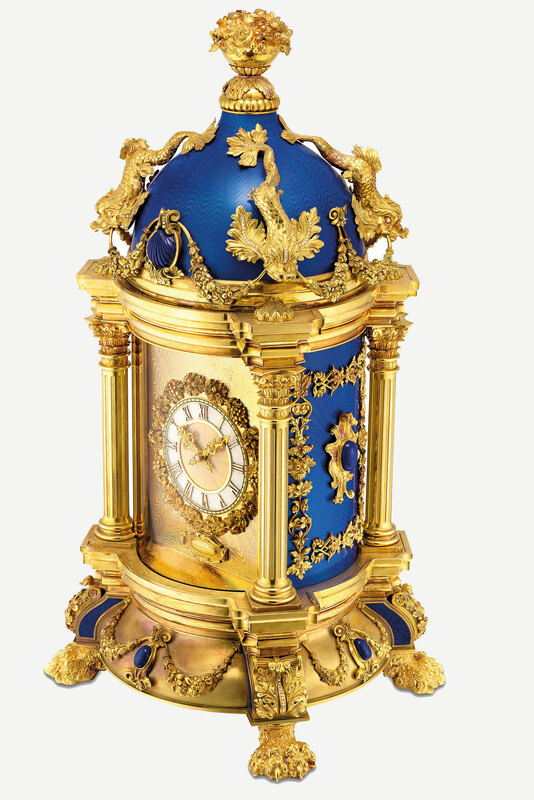 Weighing an extraordinary 6kg and designed in a baroque style that would suit President-Elect Trump’s penthouse, the clock is made of yellow gold, silver, diamonds, mother-of-pearl, lapis lazuli and royal blue enamel. It sold for HK$5.12m, or US$659,968, going to a tall gentleman standing at the rear of the room whom everyone recognised: Osvaldo Patrizzi. Bidding with determination, Patrizzi was the founder of watch auction house Antiquorum and once the most powerful man in the business, until he sold the company and got embroiled in a legal battle surrounding the sale. 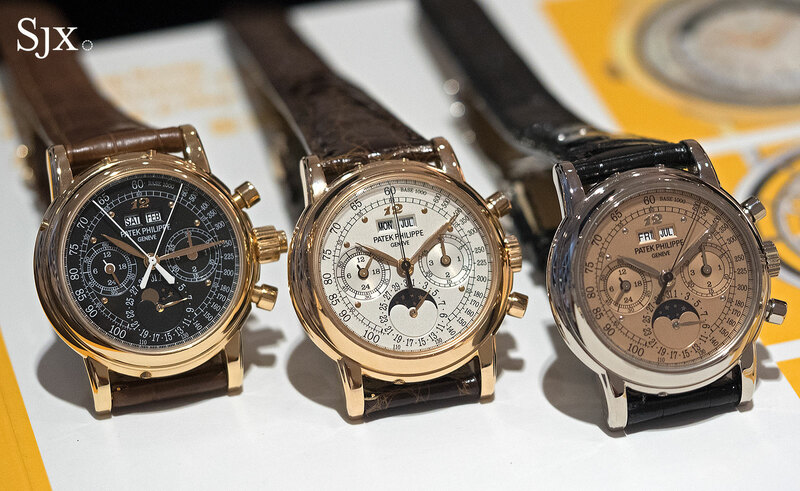 Three of Eric Clapton’s custom-ordered Patek Philippe chronographs were on offer, but one did exceptionally well. 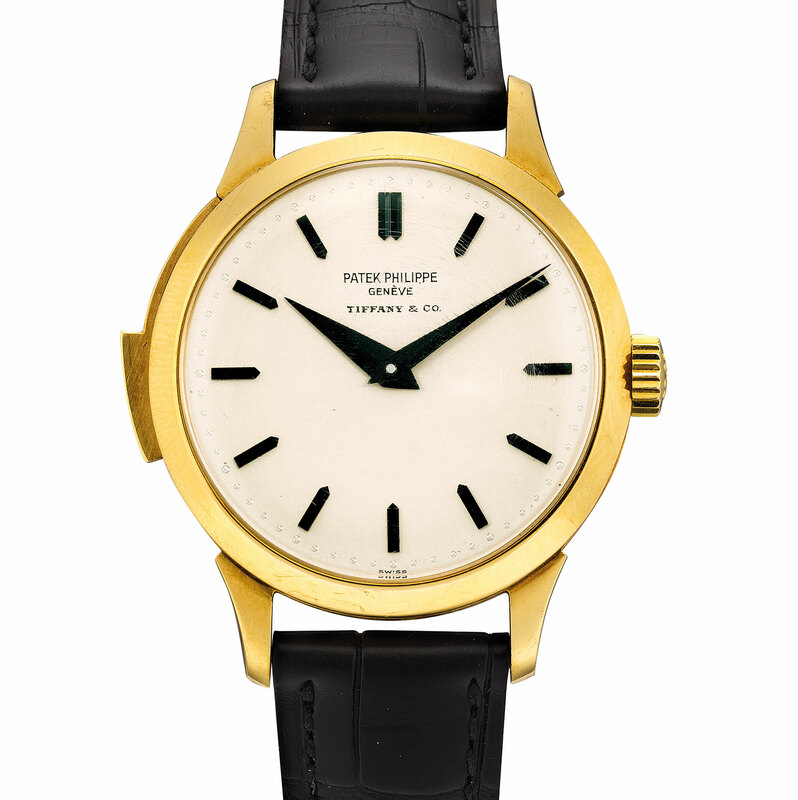 The white gold Patek Philippe ref. 3970G with a salmon dial – a combination that’s typically a crowd favourite – sold for HK$3.56m, or US$459,000, above the high estimate. That was the result of determined bidding by a phone bidder and someone on the floor locked in a battle of wills. In contrast, the next Clapton-owned lot, the pink gold ref. 3970R with an identical dial in silver sold for just HK$2m, or US$258,000. And the ref. 5004R, also an ex-Clapton watch, went for HK$3.14m, or US$405,000, making it the most reasonably buy of the trio in all likelihood. 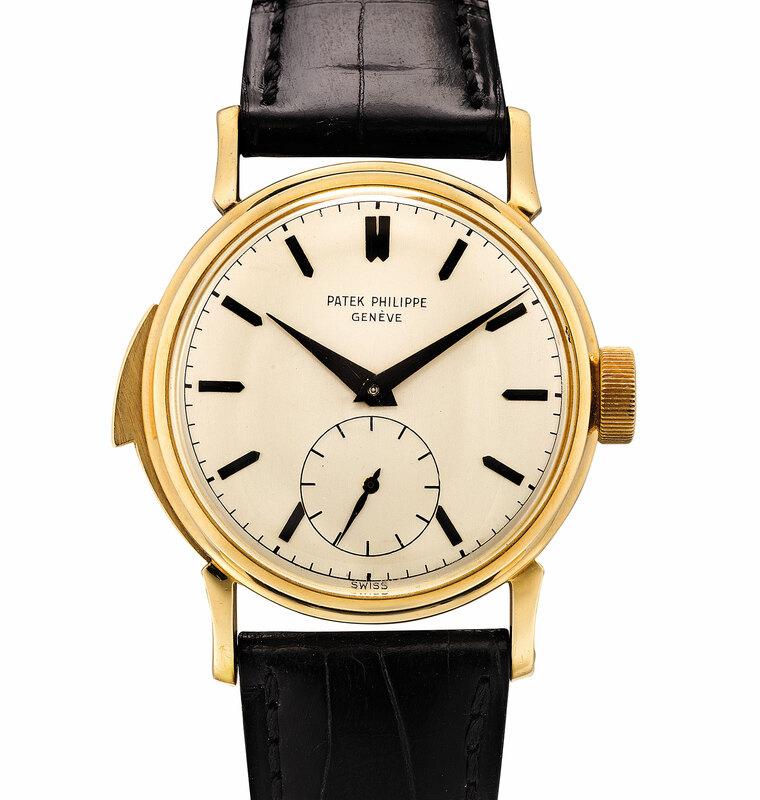 The most valuable lot of the evening was lot 1135, the unique Patek Philippe ref. 2419 minute repeater. One half of a pair originally ordered by the same owner some 60 years ago, the ref. 2419 is the only one of its kind, being a unique reference with unusual features, namely an oversized crown and repeater slide, as well as black hands and hour markers. The contest for this was drawn out, with the kind of carefully paced but resolute bidding that results in a staggering price. The bill was HK$9.8m, or US$1.26m, thanks to a victorious phone bidder from Japan represented by Phillips’ Kaz Fujimoto. That was a surprise to all in the room, given it last sold for just over US$700,000 in 2011. Intriguingly the underbidder on the ref. 2419 was the winner of the the matching ref. 2524/1, which was the lot before. Bidding on the phone via Tiffany To of Phillips, the underbidder presumably wanted to keep the pair together. While he did not succeed, he did land the ref. 2524/1 for less than half its counterpart, HK$4.04m or US$521,000. Also notable were the watches from notable independent watchmakers, including the pair of Dufour Simplicities that did well, as expected given the benchmark set at Christie’s the day before. 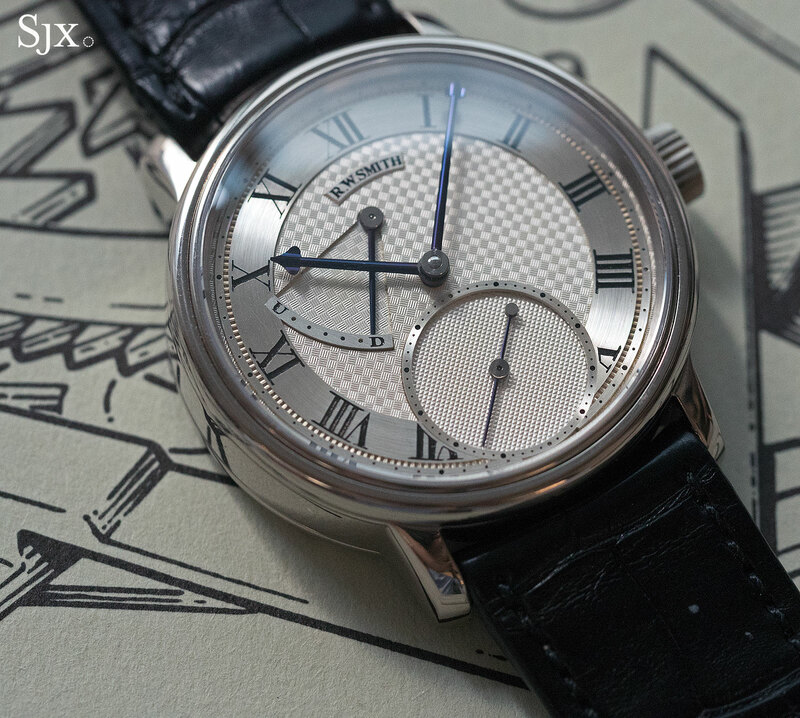 Unusually the Roger Smith Series 2 in white gold sold for HK$1.13m, or US$145,000. That’s equivalent to the current retail of the equivalent in the English watchmaker’s line-up, which is arguably more refined and well finished than the earlier piece on offer. That being said, the Series 2 that sold had a 38mm case, a size no longer offered by Smith, so perhaps someone just really had to have a smaller watch. 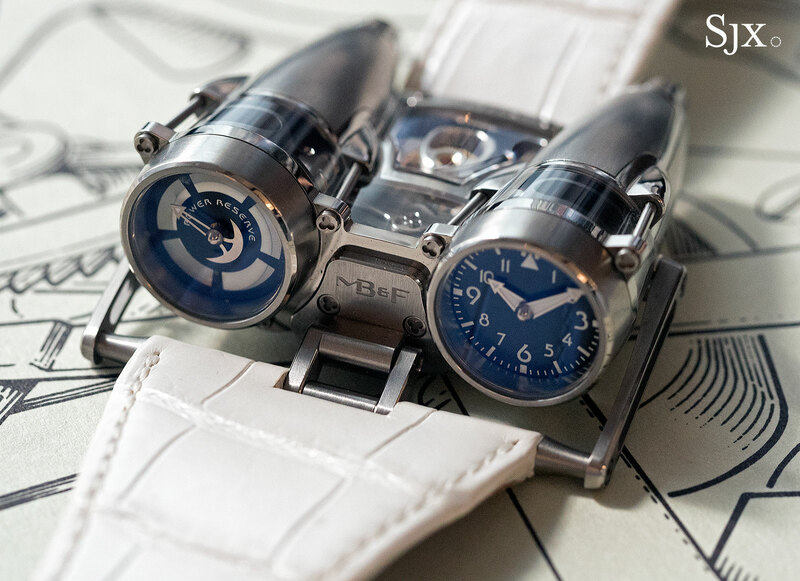 Similarly, the MB&F HM4 “Thunderbolt” sold for HK$1.25m, or US$161,000, about the same as the original retail price when it was launched. The HM4 is already discontinued and sold out, but this bodes well for MB&F’s creations, given the mixed track record for such avant-garde timepieces at auction. But it was not all good news for the independents. 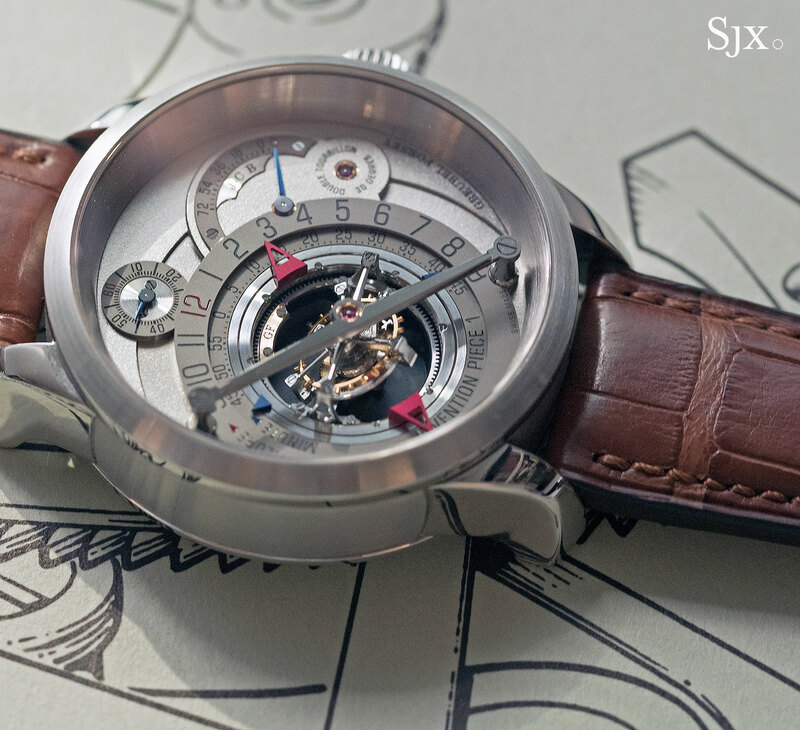 The Greubel Forsey IP1, possibly the brand’s most dazzling watch, sold for just HK$1.75m, or US$226,000, less than half the original retail of about US$600,000. That’s despite the watch being unworn and boasting a stellar provenance, being from the collection of TAG Heuer chief executive Jean-Claude Biver, who has his initials on the dial. Fortunately, with Swiss business title Bilanz estimating Mr Biver’s net worth at SFr175m, he won’t be too badly off. The full list of results can be seen here. Update November 30, 2016: Additional information on bidders added, including lot 1108. Phillips and SJX are pleased to bring you highlights from the upcoming Hong Kong sale at the preview exhibition in Singapore on May 6, 2016.